Performers include: Ashley Tisdale, Mike Castle, Matt Cook, Lauren Lapkus, Ryan Pinkston, Diona Reasonover, and George Wendt. This sitcom revolves around a group of young barbershop co-workers who all went to high school together but ran in very different crowds. They are dreamer Danni (Ashley Tisdale), athletic A.J. 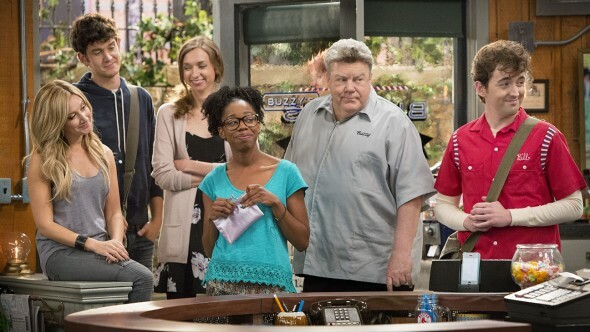 (Mike Castle), oddball Mo (Matt Cook), do-gooder Joy (Lauren Lapkus), and street-saavy Charmaine (Diona Reasonova). Now, they find themselves working together at Buzzy’s in Charlestown, Mass. Their dreams may lie across the Charles River in Boston, but for now, their work, lives, loves and other worries remain in the town they grew up in. The shop is owned by abrasive Ben (Ryan Pinkston) and the glue that holds the shop together is its namesake — Buzzy (George Wendt). He’s a gay old-school barber who has a gambling problem. His boyfriend is Tommy (Reginald VelJohnson), a parking attendant. What do you think? Do you like the Clipped TV show? Do you think it should have been cancelled or renewed for a second season? I loved this show…RENEW IT! We thought the show was original, funny and different. Sorry to see it go. I am very upset about this show being cancelled. My husband and I really enjoyed this show. We have it on dvr and watch the first season over and over and it makes us laugh. I thoroughly enjoyed this show! Why it was cancelled is beyond me(?) I liked the humor and thought it was written well. Why to they keep taking good shows off the air and keep all the crappy stuff? Not sure why the show was cancelled, but we loved to watch it, so much so that we would DVR it. We need more humor like that. Need it to keep going. Disappointed that it’s off the air. loved the show. made me laugh out loud every episode. give it another season. it was never advertised enough. Love the show. I am over all reality shows in general . I watch Friends, King of Queens, Everyone Loves Raymond, etc. This show was great!! Bring back the comedy!! We actually enjoyed the show Clipped. We would love it to continue. We love Clipped! It’s a refreshing entertaining show that is not afraid to use strong language. Keep it going! I love this show, it needs to be continued!